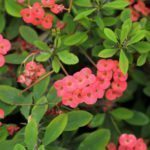 I am a snowbird, but when I came to fFlorida in end of July , my large pots of crown of thorns were doing well, but now after my return in Nov. they were dry, had white spots on leaves, and some leaves are blackish. What can I do? This sounds like a fungal issue. This can be caused by the soil remaining wet for too long. Usually, this can be corrected with something as simple as wettable sulfur. This will take care of the infection rather quickly. The old growth will not recover, but new growth will come out unaffected. Just be careful when cutting off any dead growth, as these plants can cause some painful irritation to some.